Traditional Camembert is made from the fresh raw milk of Norman cows, which is high in fat and rich in proteins and vitamins. Unfortunately, US law only allows us to import pasteurized Camembert. The milk is heated and poured into large vats and then a natural rennet is added. Once the curds have formed they are ladled out carefully (to prevent them from breaking) into individual cheese molds. When the cheeses have drained sufficiently, they are turned over. On the second day, the cheeses are removed from the molds and taken to the salting room. Here dry salt is shaken onto all surfaces of each cheese. On the third day the cheeses are placed in the drying room and it is here that the mold rind forms. 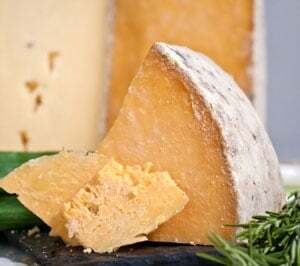 The ripening period is approximately twelve days, depending on the season, after which the cheeses are ready for packing. Once packed in their distinctive boxes, they are aged for another four or five days before being sent to market. We cannot talk about Camembert without mentioning the distinctive Camembert box. Originally Camembert was sold in straw cases. Toward the end of the 19th century, railways and steamboats spread all over Europe, and this created new opportunities for Camembert to be sold throughout France and abroad. Unfortunately, the straw case style of packing did not protect the cheese for long journeys. In the town of Le Havre around 1890, a French cheese exporter, M. Rousset, decided to use spruce-wood boxes similar to those used for other French cheeses. Around the same time, Eugène Ridel, created a nailed and stapled circular poplar wood box—an instant hit, and now a tradition. The flavor of Camembert is definitely the main reason for its worldwide popularity. Open the lid on your Camembert box and you will immediately notice an aroma of mushrooms with a subtle braised cabbage undertone. These two aromas are the quintessential elements of true Camembert. The rind is an ivory white with red flecks through it, and if you stroke the cheese you will feel the downy texture of the penicillin rind. The rind is essential to creating Camembert. As the mold rind grows around the cheese it sends out microscopic roots (rhizomes), and it is these roots, working from the outside in, that turn the texture from chalky to voluptuously soft and gooey. Whether you eat the rind or not is a personal choice. Eating it will intensify the flavor and give you an added dimension in texture. The Camembert you have received is perfectly ripe. If you ever see Camembert with a thick chalky center, the rind did not complete the ripening process. 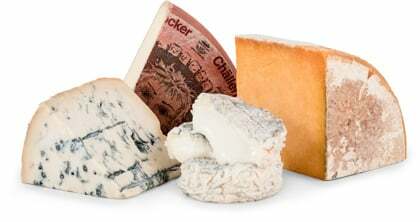 As with most cheeses, the flavor becomes more intense as the cheese ripens.